Render Legion has finally released Corona Renderer 2 for 3DS Max which is all about improving compatibility, adding support for heterogeneous media and V-Ray scenes, new materials, a new toolbar, reduction of memory consumption, improved Bokeh, and more. 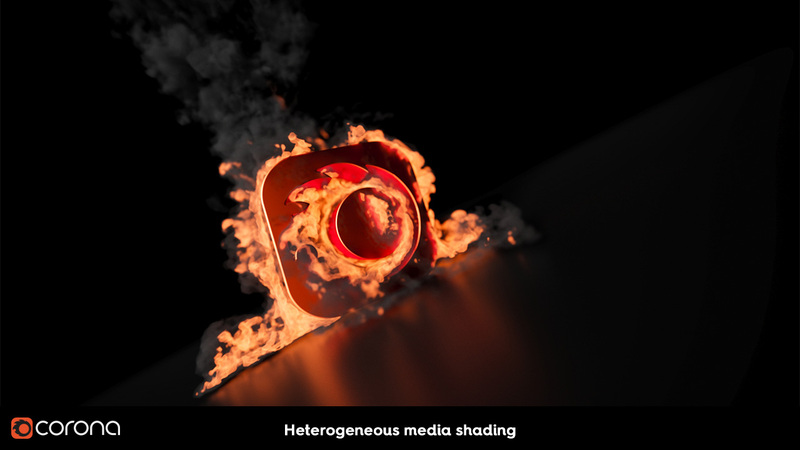 Support has been added for heterogeneous volumes, which means Corona Renderer now supports Phoenix FD, FumeFX, OpenVDB, and 3ds Max texture maps. This includes full support for multi-bounce GI inside the volumes and motion blur, so now you can render smoke, fire, liquids and more in your favourite render engine! The same technology that lets Corona Renderer create 3D volumes using the CoronaVolume material also enables rendering of volumes from other specialist simulation plugins, such as Phoenix FD. Again, the same underlying functionality allows Corona Renderer to render FumeFX simulations. Motion blur, space warps, illumination maps and the channel data shader are currently not supported. For a quick guide on using the Corona Volume Grid, see: How to use the Corona Volume Grid? Corona Renderer can work with OpenVDB files. These are files which allow you to store “voxels” in a 3D grid, along with optional additional data such as density, velocity, temperature, etc. OpenVDB files can be created in a variety of software, for example SideFX Houdini, Phoenix FD, Blender, etc. These can be loaded and rendered using the CoronaVolumeGrid object, which then allows you to set Absorption, Scattering and Emission properties for the VolumeGrid. These properties can be driven by the density, velocity, temperature, and other extra data contained within the OpenVDB file. The CoronaVolumeGrid object will detect when Emission data can be interpreted as temperature, e.g. for OpenVDB files exported from Phoenix FD and other software. The CoronaVolume material now has two modes, the old “On Surface” mode, and a new “Inside Volume” mode. This new mode allows the CoronaVolume material to render actual volumes inside objects, rather than just calculating the result at the surface of the object. It can work with native 3ds Max noise maps, in Object or World XYZ mode, which calculate noise in 3D space. The potential uses are limitless, allowing you to create low lying mist, clouds, ice, and more, either used on its own or in combination with things like the CoronaDistance map. Previously, with the old mode, creating low-lying mist would require you to create specific geometry for it – now with the new Inside Volume mode you can use a CoronaVolume in the Global volume material slot, and with some CoronaDistance and noise magic, get the desired result! The test video below, made during the development of Corona Renderer 2, will give you some initial ideas on the many ways you can use this functionality! Are you a freelancer who keeps finding those perfect assets for your project… but they are V-Ray scenes, and you don’t have V-Ray installed so can’t use the converter? Are you a studio that uses both V-Ray and Corona depending on a project’s needs (or even depending on department)? Do you use V-Ray but want to try out Corona Renderer in your existing scenes to see what all the fuss is about? If so, then the good news is that now you can render V-Ray assets (created in V-Ray 3.60 or newer – assets from earlier versions may also work, but this is not guaranteed) without having to run any sort of conversion – even without V-Ray being installed! You can find the full breakdown of the newest version here.